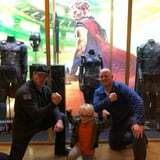 Chris Pratt and his 5-year-old son, Jack, flexed their muscles for an adorable photo after watching Thor: Ragnarok on Friday. "HOLY CRAP!! THOR RAGNAROK IS ABSOLUTELY AMAZING!!! We just laughed our asses off!!!" Chris wrote on Instagram. The proud dad has kept a low profile since the joint announcement of his split with wife Anna Faris in August. "Our son has two parents who love him very much and for his sake we want to keep this situation as private as possible moving forward," the statement read. While details about what caused their separation are still scarce, (sources have claimed Chris's rising fame had something to do with it), Anna opened up about their breakup during a recent appearance on Live With Kelly and Ryan. "We're great," she told the hosts, adding, "He's amazing. We're great friends and we always will be."